This all inspiring MusiVation MP3 program will help you reach deep down to create the perfect harmony in every area of your life. With the world renowned powerful MusiVation Affirmation songs like, � I AM A MIRACLE � I AM HEALED � DIVINE LOVE � PERFECT RELATIONSHIPS � NEVER LONELY and many others. Also includes a truly powerful healing guided meditation with specialist Master Intuitive Russell Feingold PLUS affirmation cards, and a seminar discussion on healing and how to become healed. 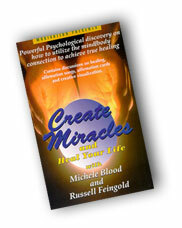 In this program Michele Blood uses her great discovery MusiVation™ and shows you how to quickly alter old destructive conditioning so that you will �Create Miracles� by affecting both hemispheres of your brain: the right side, your emotional creative side, with the music, and your left brain with the powerfully positive messages. If you truly desire healing and happiness, this product is a must.